If you're someone who wants to live a more fulfilled and inspired life then you know the importance of changing your life and especially your mindset. You know that magical things happen when your mindset shifts and you get into a state of flow. Your whole body feels different and opportunities just kind of appear. It's amazing! There's a whole revolution happening right now with countless podcasts, courses, and blogs about how to get into a state of flow and really utilize the law of attraction. But few people are talking about how making subtle changes to your home and office environment can make a big impact. One person that has been talking about this for decades is Marie Diamond. You may know her from the movie the Secret. She's a feng shui expert and her perspective on what we surround ourselves with on a daily basis is really fascinating. In the above video she says that what we see and experience in our homes and office spaces can change our brain waves...and this really hit home for me. Two years ago I was pretty down and I couldn't seem to get myself out of it...then I started to systematically clear my home and studio of objects that didn't bring joy, were broken, or simply I didn't need in the life that I wanted. I then started hanging artwork that inspired me on my walls, lamps with character that made me smile and started using my nice dishes on a daily basis. It was pretty amazing how much more positive I started feeling about my life...and pretty soon after that I had the courage to take some big risks which are really starting to pay off. According to Marie, "your environment is supporting your soul purpose" and I completely agree. Our home and office spaces are sending us constant subconscious messages about what is possible and setting the tone for how we feel. Little changes in color, the spacing of our furniture, and simply putting artwork that inspires us in prominent places in the room can make a huge difference. If you'd like to get more in-depth look at Marie's philosophy, watch the below video. So if you've just watched this video and you feel inspired to change your own environment...let me help you get started. First I recommend reading Marie Kondo's book, Spark Joy. 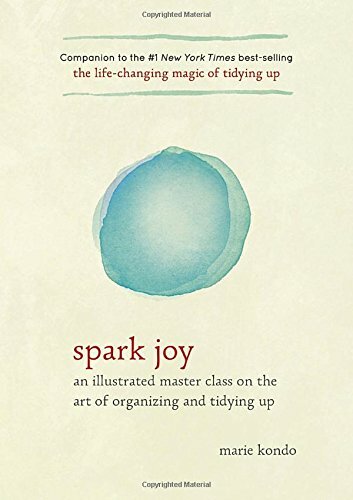 It's a condensed instruction-based follow-up to her ground-breaking book The Life-Changing Magic of Tidying Up. It will help you better understand what you should keep in your house and what you should give to charity or simply throw away...and the best process to do this so you feel at peace after it's finished. Second after you've taken massive action then you'll probably have a lot of blank space in your home. First I recommend living with the blank space for a few weeks and take that time to figure out what style of artwork and furniture really inspire you. Visit websites. Visit stores. Let your intuition guide you. If you see something that you love you'll feel a sense of relief and joy in your body. If you something isn't for you then you'll feel tense. And don't worry about everything being perfect. The most inviting warm homes are a work in progress! If you find that your style is modern and that you really love abstract artwork then I highly recommend checking out my numerous room designs. They are all modern and sleek but each has a different take...some are glamorous...some are modern rustic...and some are inspired by mid-century furniture. I've made sure to cover the gamut of room types....from living rooms to home offices to bedrooms. If you'd like to receive a weekly digest of my latest room designs sign up below.